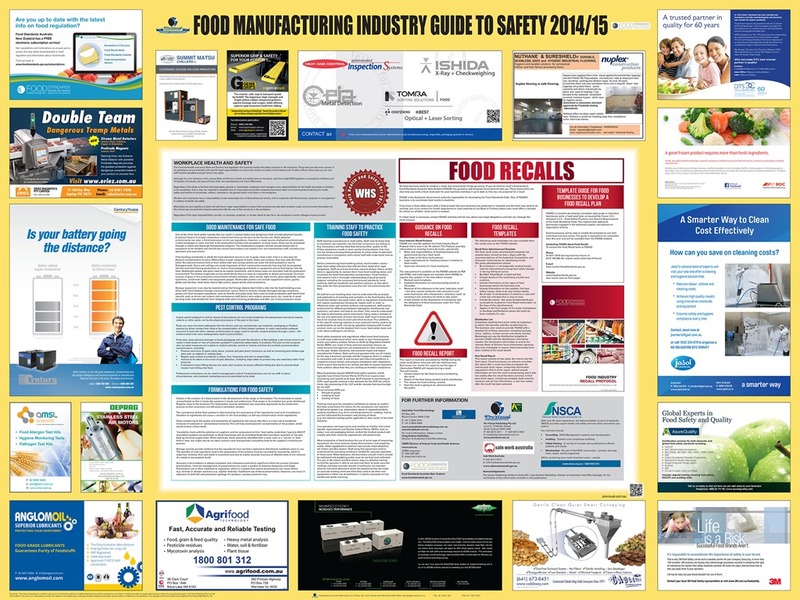 Pro-Visual Publishing is pleased to announce its newest edition of the Food Manufacturing Industry Guide to Safety 2014/15. In collaboration with the Australian Food Microbiology, this year’s guide aims to address all aspects of the food manufacturing industry, ensuring that employers and employees are maintaining a safe and healthy workplace. This year’s edition focuses on maintaining a clean and sterile work environment so contamination does not occur. It is particularly important to shield food away from bacteria which can be accomplished through a thorough maintenance program that includes equipment check-ups, as well as observations and reports from non-maintenance staff, such as line operators and supervisors. It is imperative to closely monitor the quality and traceability of ingredients in order to avoid potential contamination of food products. This is otherwise known as a Food Recall. This topic is also featured on this year’s guide, which highlights the roles and responsibilities of food businesses and government during a food recall, key steps involved in the process, vital elements of a food recall plan, and the legal requirements and obligations for food businesses. All these steps will assist businesses manage food recalls effectively. “I would like to thank all of the sponsors of the Food Manufacturing Industry Guide to Safety 2014/15. Their support has made it possible for the guide to be distributed free of charge” – John Hutchings, CEO, Pro-Visual Publishing. Pro-Visual Publishing is the leading specialist in wall-mounted workplace health & safety, food safety & hygiene and health and wellbeing information resource charts. Each chart is practical and informative, providing a quick reference point for management and staff. Pro-Visual Publishing’s charts are designed to inform, motivate, educate and above all keep people and their workplaces safe!